DS106 (http://ds106.us/) is a computer science course in Digital Storytelling at the University of Mary Washington (UMW), framed on principles of the web as a platform for storytelling. Students learn to manage their own digital domain in the process of understanding storytelling and creating media. 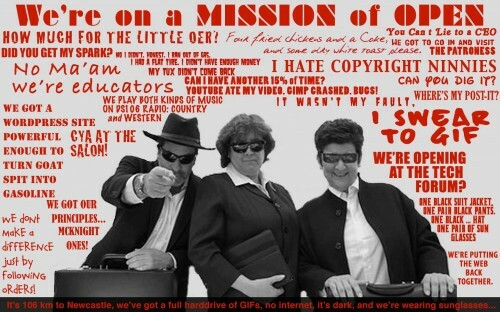 In 2011, DS106 opened up to a global community of online participants. This case study explores how DS106 tools, methodology and philosophy were adapted into the corporate world at 3M to build community, collaboration, and effective global communication skills. Our hypothesis was the pedagogy and assignments of the DS106 open course could be modified for delivery on a corporate intranet, using internal creation and communication tools standard for 3M employees. We hoped to learn how the course experience could work within cultural and technological constraints of a corporate environment. Participants in 3M-DS106 were based in Minnesota, Texas and California. A majority were active members in the 3M Technical Collaboration chapter, a subset of the 3M Technical Forum (12,000 plus global members), which fosters communication across a diverse technical community. 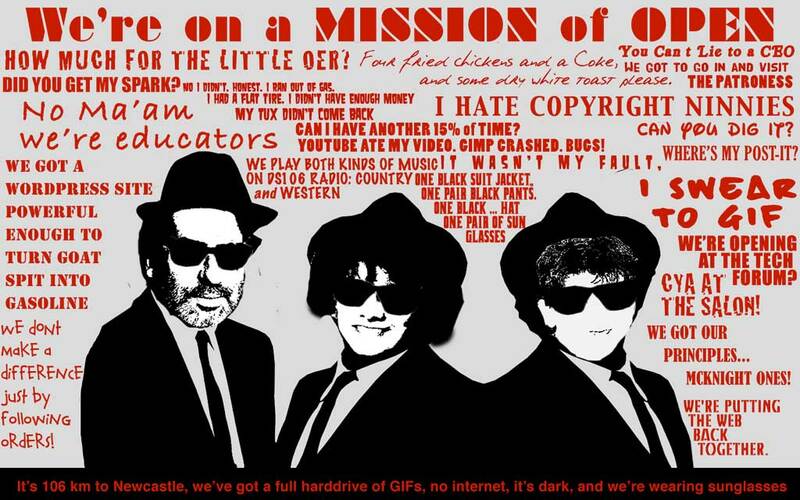 Blame me for the Blues Brothers theme. 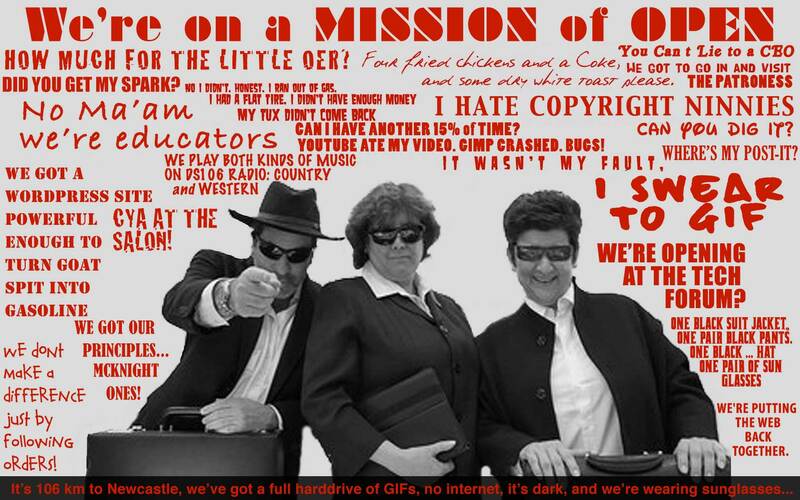 It was a few weeks ago, thinking as usual of some sort of conference shtick, and the neural jumps led me to the classic line, “We’re on a mission from God”, leading to the modified version, “We’re on a mission of Open”. It’s 106 miles to Chicago we got a full tank of gas, half a pack of cigarettes, its dark and we’re wearing sunglasses.. I think I look more Hassidic then Blues Brother, but thats another story. The grand plan was entering with each of us having a letter on front of the brief case, which we would plop on the table spelling “O” “E” and “R”, and then popping them open, spinning around, to reveal “3M” “DS” and “106”. Finding brief cases was a challenge (thanks to David Kernohan for bringing one to use), we decided that was not quite needed. The idea we hatched was to break out of the presentation mode of the conference slot 20 minutes of linear slide flipping and 10 minutes of Q&A, to pretend it was a business meeting (Mariana deftly played the impatient CEO) and that the audience was with Rochelle and I at the table to ask and answer questions. I set up a keynote that instead of slides, used a drawing made for us by Giulia Forsythe as a map, and I set up keynote to jump to sides with a larger version of the image for different sections. And rigged a small graphic to return back to the map. Both Mariana and i felt that the bulk of the presentation was really for Rochelle’s story of what ti took to run a version of the open DS106 course inside the corporate firewall of 3M. The whole concept alters the typical binary perception of “Open” vs “closed” to one of degrees, layers, or just principles of openness, that open approaches can work inside what might be seen as a closed system, yet is not closed given a network connector, or patroness, such as Rochelle. There were some good questions in from the “audience” meeting members; at the end it was from… someone in the back of the hall, about whether the biggest challenge inside 3M was the issue of openness or what happens when you encourage creativity. Needless to say we had a bit lot of fun presenting here. But it has been a fantastic two day conference experience where there was a lot of excellent interchange between session, great discussions, and even some playing with legos. Pingback: The New JIME Is Here! If News Publishers Do Not Bother With Creative Commons Attribution, Why Should You and I?